Cedrus deodara is an elegant, large conifer with lightly drooping branches. At first, Cedrus deodara grows in a pyramidal form before broadening gracefully with age and reaching a height and spread of 7 x 5 metres in 20 years. 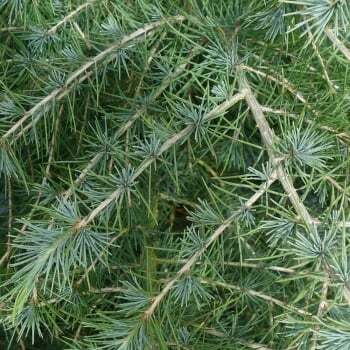 The evergreen needles measure around 4cm long and are green with a hint of blue. Cones up to 10 cm long form among the needles, with male cones being slightly smaller than female ones. Native to the western Himalayas, the Deodar Cedar tree has been recorded eventually growing to a grand height given time and the right conditions. It will not reach the same heights in the UK, but is happy planted in well-drained soil in sun or part shade and can cope with exposure. When planting Cedar trees, it is important to prepare the planting area well. Pot grown trees can be planted at any time of the year. Cedar trees do not require a lot of pruning. Simply remove any dead, diseased or awkwardly placed branches as and when you see them.